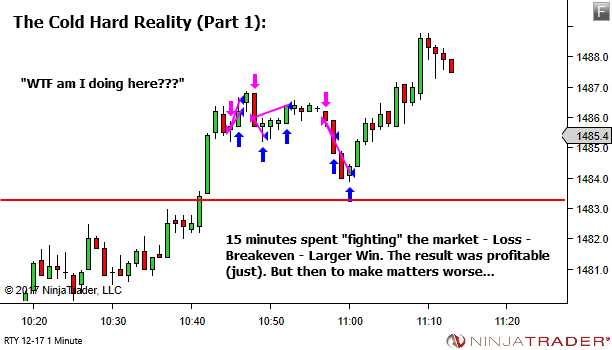 Trading – the art of managing the imperfection of human decision and action in an environment of uncertainty. 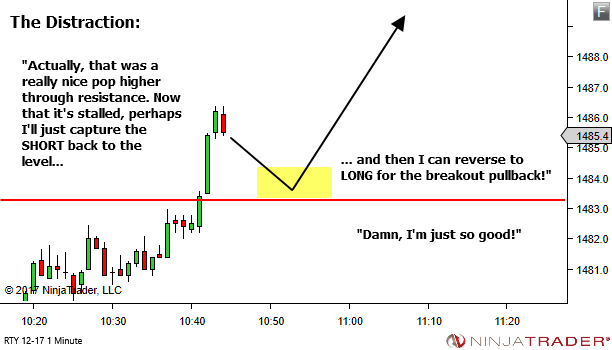 In this pullback to the breakout level, the red candles are pretty strong. And then the first bull candle is just a high close range candle. Would you go long above this combination? Or is it buy because cannot go down? And the scratch and re-enter if proven early? Or something totally else on LTF? Mahesh, both are correct. They’re the same in this case. The plan as always is buying because it can’t go down, with scratch and re-enter used to manage risk if I find I’m early. Until price created the narrow range bar you don’t know that one will be offered. But upon seeing the narrow range stall region, showing as the narrow green bar (the high close range candle), a break above this bar provides sufficient proof that “it can’t go down”. 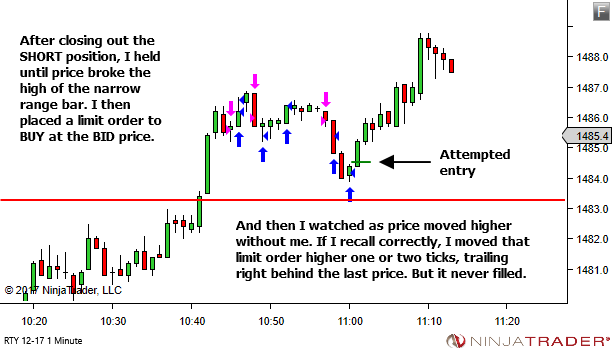 So entry was attempted as soon as price ticked above that bar. It just didn’t fill because of the order type used. Thanks for another lovely post. But in my opinion i think the entry short @ 1486 was pretty good. 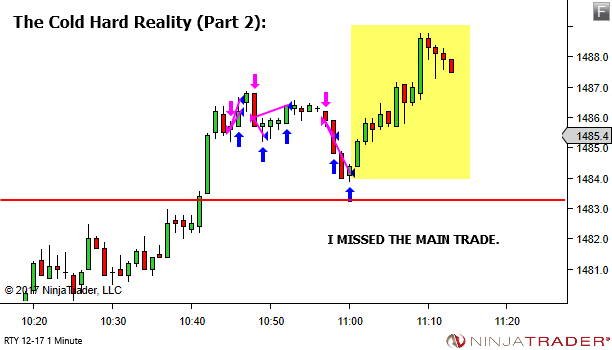 There was 2 leg weakness following the bull spike showing weak bulls. If I may, which signal could signal entry long @1484 sinc the last bear move was quite a strong one? 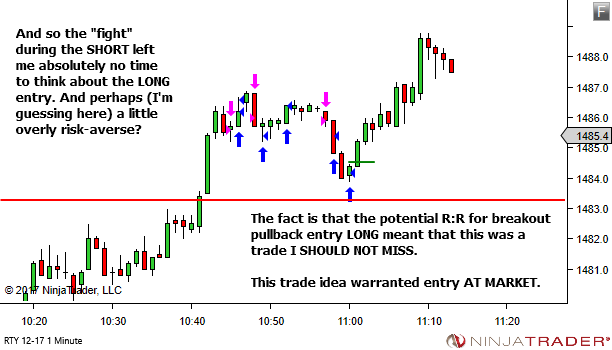 The entry short from around 1486 was a good trade. I’m happy I took that. 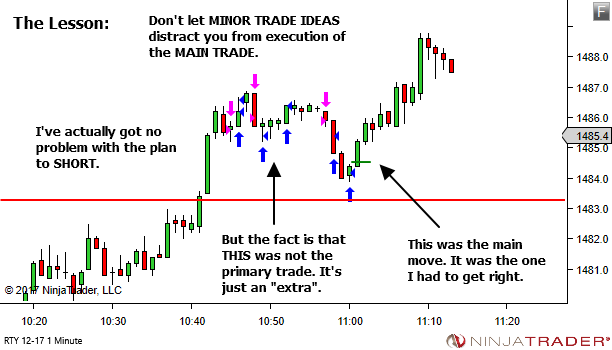 As mentioned in the article (6th image) I’ve got no problems with the plan to trade SHORT. The problem is simply in allowing this to distract me from the LONG, which was the main idea. 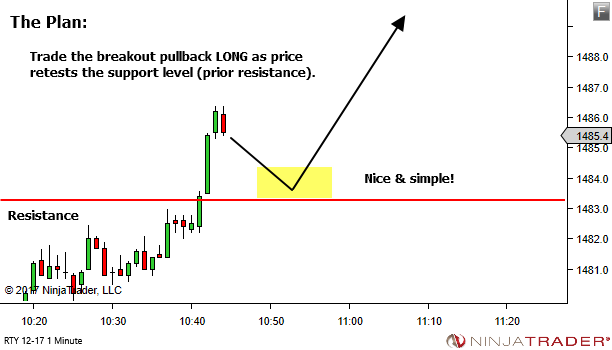 Entry SHORT should only ever be targeting the support level. Why aim for entry LONG at 1484? (b) You need to ask whether what appears to be strength in the bearish move is a result of an actual shift in sentiment with new interest from new SHORTS, or more likely just LONGS stopping out. I’d suggest the latter is probably a higher probability. And if that’s the case what we should see is a small acceleration lower as the stop area is trigged, but then a stalling of price due to the move not attracting any wider interest from other potential SHORTS. That is exactly what occurred. The push lower (appearing to show strength) but then a stall (an indication the strength was perhaps illusory and just stop driven rather than a real shift in sentiment). Entry is then taken once I’m confident that the bears are not interested (on a break above the narrow range stall region). It’s the principle of entering LONG when the bears show they can’t push price lower, rather than waiting for confirmation through seeing bulls push it higher. Exactly right. 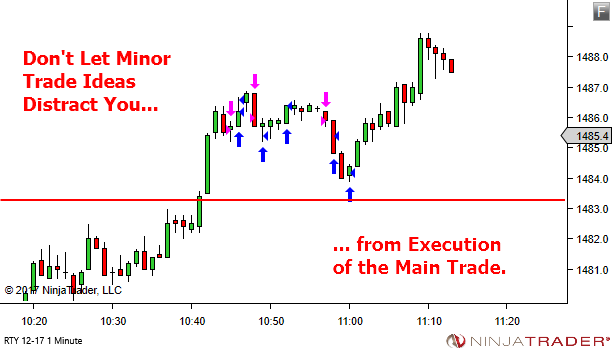 Contextually, it’s moving into a great location for entry LONG. And the overall bias is still bullish. So look to any moves against bias to provide a trap of some kind. Just request you to tell some more ideas about distinguishing between strength due to shift in sentiment and stop driven strength. Would be very helpful in recognizing if a counter trend is going to be a trap. Thanks Mahesh, I will certainly do this. But in the meantime, please look to the comments section from this article for my discussion with Obasi Ekele. It covers the same question. The move down, although appearing strong, is still only taking price into a contextual location that is ideal for entry LONG. And it’s against the current market bias. So this is a key time to consider the apparent strength in more detail. Is it really an indication of market-wide sentiment shifting to bearish? 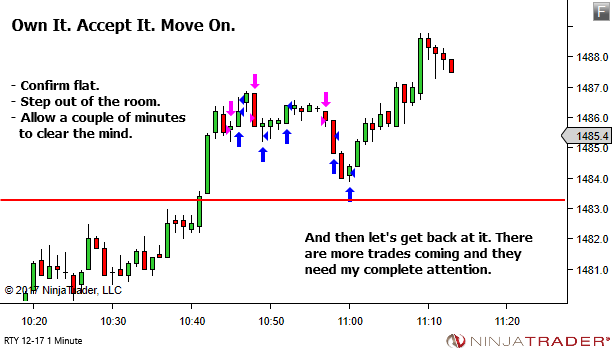 Or is it perhaps just a result of a short-term accumulation of stops. Given the way price formed a nice topping pattern, it’s quite reasonable to expect that longs might have raised stops below that pattern. This can give it a little push. The question then becomes – will that push lower continue (indicating a potential complete shift in sentiment) or will it die off just as quickly as it began (indicating perhaps just stop driven orderflow, bringing price into a good entry zone for the opposite-direction trade). so thank you.Your article teaches me something new.in this sample.i think i am not to open short ,and though i wanter long ,but the drow back is strong than befor(pink arrow).so hold the money is good.